Cocoa: What? 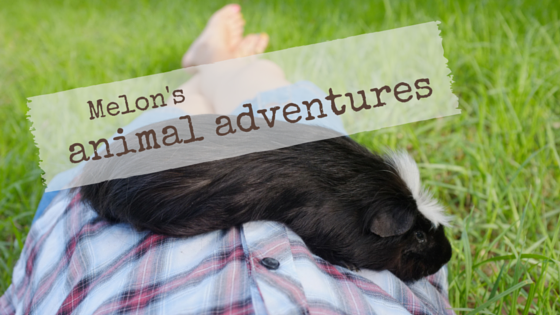 You thought this blog was about a guinea pig. Well, let me tell you, me too. But I'd better hand over to Melon for this one. Melon: So a friend of mine, J, is living in a share house with her boyfriend. They have inherited from his parents, along with the house, a golden-retriever type dog named Jackson. Now, it has come to my attention that Jackson is never walked. He is not let into the house because he smells, because he is dirty. His two dishes (one food, one water I assume?) were completely empty last time I saw them. (But dogs only get fed twice a day right? Not like guinea pigs?) There were dog food bags on the counter though. So here's my idea: to offer to walk their dog regularly. I came up with the idea that I could walk their dog, and had a whole bunch of questions for you guys about whether it was a good idea and how I could do it, my mind jumping ahead to how I could handle the dog and how I could blog about developing a bond with him and getting my dog-fix. But now I've rethought: my doing the hardest part just to make sure it gets done will not ensure that its other needs are met. I’m going to start by reminding the owners what should be done for the dog – making sure it always has water and 2 meals a day, keeping it clean so it can come inside, and walking it. If they don't do that then I will urge them to return him to their parents, if I can gather that they will care for him properly. Because I’ve been wanting more experience with dogs (I’m considering volunteering for the RSPCA) I’d love to get involved by offering to walk him, but that’s not a long-term solution for the dog. He need someone who will take responsibility for all his needs. Only if they won’t do those things and they refuse to rehome him, then I will offer to do as much as I can to help the dog out, like coming round and walking him myself. Does that sound right? My friend has already accepted my offer to come and help bathe the dog, which I’m starting with because I’m pretty sure if he doesn’t smell he’ll be allowed inside the house. To prepare myself I’m off to another friend’s place in a few days to practice the b-a-t-h thing with her Labrador! I’ll keep you guys updated on how this goes, and I will be grateful for any and all advice. Note, Added Later: Both baths went well. (My friend and I got into a car accident on the way home from Jackson’s, but that’s another story.) It was getting late by the time we were done with Jackson so we took him just up the street afterwards because he’d been hankering for a walk, and boy, did I know it! He planted himself at the end of the street and I had to coax him to turn around, poor guy! You’ll hear more about both dogs to come. Please give us an update about Jackson. We will be dying to hear more. Have a fabulous Friday. You are wonderful to help Jackson. We look forward to hearing more.